Plan view of the Giza Plateau showing how the three "belt stars" of Orion would look if scaled to fit the pyramids. ...with who, what, where, would come the opening of the records that are as copies from the sunken Atlantis; for with the change it must rise (the temple) again. This in position lies, as the sun rises from the waters, the line of the shadow (or light) falls between the paws of the Sphinx, that was later set as the sentinel or guard, and which may not be entered from the connecting chambers from the Sphinx's paw (right paw) until the TIME has been fulfilled when the changes must be active in this sphere of man's experience. Between, then, the Sphinx and the river. In the information as respecting the pyramids, their purpose in the experience of the peoples, in the period when there was the rebuilding of the priest during the return in the land, some 10,500 before the coming of the Christ into the land, there was first that attempt to restore and to add to that which had been begun on what is called the Sphinx, and the treasure or storehouse facing same, between this and the Nile, in which those records were kept by Arart and Araaraart in the period. The entity aided in those activities, being among the children of the Law of One from Atlantis; AIDING the Priest in that preparation, in that manner of building the temples of records that lie just beyond that enigma that still is the mystery of mysteries to those who seek to know what were the manners of thought of the ancient sons who made man - a beast - as a part of the consciousness. 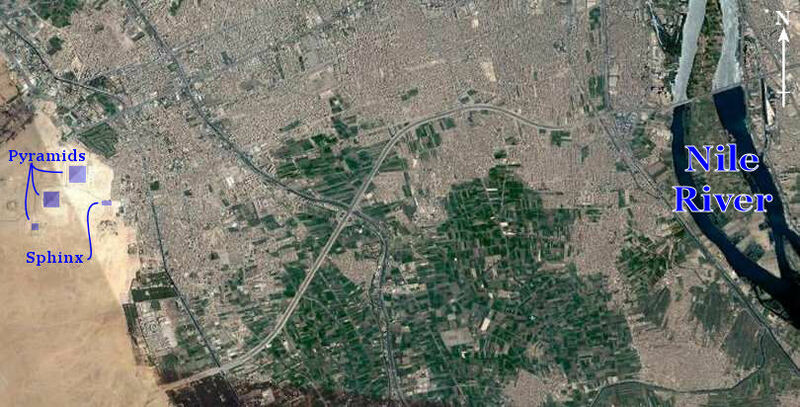 (Q) In referring to the uncovered pyramids in the Egyptian land, near what present place are these pyramids? (A) Between that as is known as the Mystery of the Ages and the river. Without question, one can plainly read that the Hall of Records is located somewhere in the rather large area between the Sphinx and the Nile River. It is also obvious that there are apparently many pyramids that are yet to be uncovered, not just one as is commonly believed. Giza Plateau showing the how the constellations Cygnus would look if scaled down and overlain on the pyramids. A red arrow indicates the star Deneb. 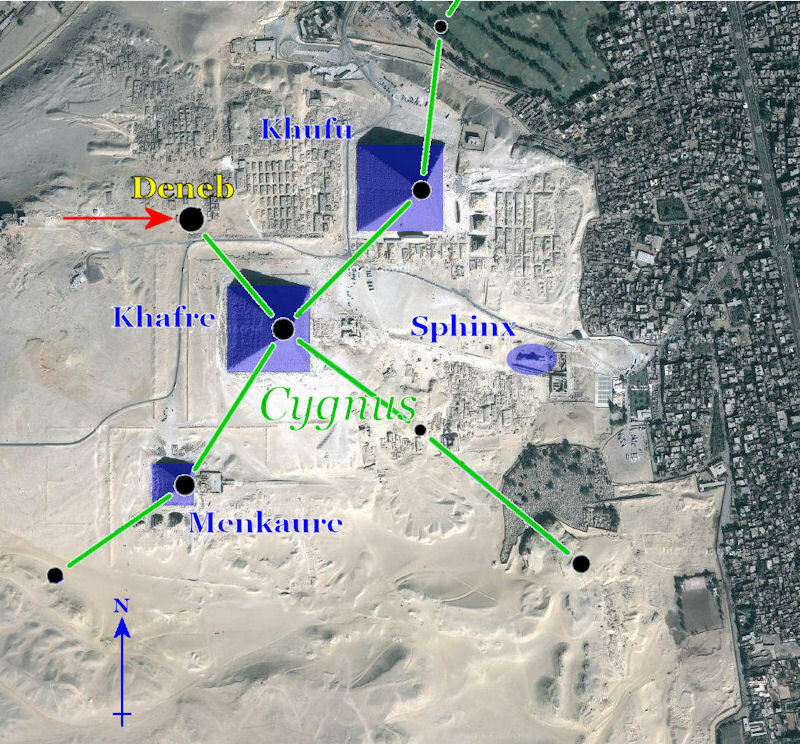 The placement of Deneb in Collins' star-map overlay of Giza, precludes it from being anywhere near the location of the Hall of Records according to readings quoted above. A more interesting constellation possibility is Lyra which contains the star Vega, the second brightest star in the northern hemisphere. Using the star-map overlay of Cygnus, but expanding the map to include Lyra, one can see how it lines up due east of the Sphinx where the "sun rises from the waters" and is located "between....the Sphinx and the river". Cayce reading 5748-6 states that the Great Pyramid was built from 10490BC to 10390BC and this just happened to be the time when Vega, through precession, was the northern polestar. Same as the previous image, except that the constellation of Lyra is added to show its position to the east and in front of the Sphinx. Dr. Lehner tells us that, despite the hopes and sometimes insistence of some members of the New Age community, no secret tunnels, hidden rooms, or Halls of Atlantean Records were located, despite many holes drilled from a multitude of angles. In fact, it is probably no accident we were allowed to witness the drilling under the left paw, as one of the more popular legends has a secret compartment hidden beneath the Sphinx's paws. When there was the entrance of Arart and Araaraart, they begin to build upon those mounds which were discovered through research. With the storehouse, or record house (where the records are still to be uncovered), there is a chamber or passage from the right forepaw to this entrance of the record chamber, or record tomb. This may not be entered without an understanding, for those that were left as guards may NOT be passed until after a period of their regeneration in the Mount, or the fifth root race begins. It is really astonishing that Dr. Lehner is unaware of what paw the connecting chambers are located beneath the Sphinx. All the Cayce reading quotes that I used in this bulletin were gleaned from an invaluable resource of Cayce readings: The Egyptian Heritage, published in 1974 by the ARE Press and authored by none other than our very own Mark Lehner.